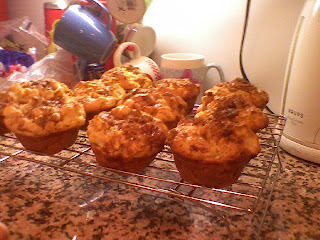 These were my second attempt at making muffins (the first didn't go so well - more on that another time) and was pretty successful. A muffin is different than a cupcake in that it uses melted butter instead of solid, and often has whole wheat flour (though not always) and fruit and nut additions, which overall make for a denser cake. These were pretty great, and they smelled amazing while in the oven - who needs Glade plug-ins anyway, just bake all day long! I doubled this recipe, as the original only makes 6, and for once I got all the ingredient amounts right - go me! I used Granny Smith apples in these, since that's what I had in the house (yes, another recipe selected simply because I already had the ingredients - nothing like laziness to make a baker resourceful!) and I personally thought they were a little tart against the sweetness of the muffin, but others liked the contrast. Golden Delicious would be a sweeter alternative, or you could experiment with a mix of different types. The recipe topping calls for crushed brown sugar cubes, which I didn't have, so I substituted regular brown sugar. I doubt it made much difference. Tip of the Day: If you don't want to use paper liners when making muffins or cupcakes, don't forget to spray the pan(s) first - or else you'll end up having to eat them out of the tray! Mix the egg, sugar, milk and butter in a bowl. Sift in flour, baking powder, salt and cinnamon. Add the apple and stir until just mixed. Spoon into muffin tin and sprinkle topping on top. Bake at 400 for 30 to 35 minutes. Welcome to blogging! I found you via HLP. Your writing style and slightly self-deprecating approach is very refreshing! Plus, I secretly want to live in NYC, so I love blogs written by New Yorkers. Not *at all* a commercial here, but have you ever checked out noteatingoutinny.com? Great food + NY site, you may find some inspiration there. catering to your lazy baking approach, here's a website that let's you type in the things you have in your kitchen and then gives you a recipe based on what you have. maybe you'll find something interesting! or terrible, i don't know. These look divine!! I can't wait to try them. I plan to substitute the sugar with splenda baking blend. (the brown sugar, too) I'll let you know how it turns out. I love to read blogs with recipes, so I am bookmarking your site and look forward to reading your posts. As promised, an update: These turned out wonderful!! The splenda substitute worked out great. Thanks for the update! Maybe next time I try these I'll try a substitute as well. I'm always reluctant to since I figure, if you're making dessert it might as well be good. Perhaps its time to reconsider!